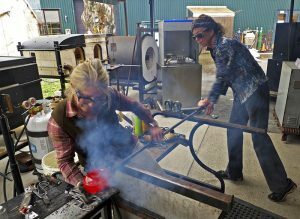 Sabrina Knowles and Jenny Pohlman have been working collaboratively to create their glass sculpture for 25 years. Their inspiration comes from their life experiences including daily interactions, international travels, and studies of ancient and contemporary cultures with an emphasis on women. 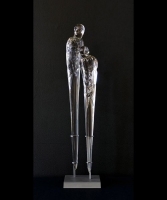 After lengthy incubation they morph their experiences into sculptural stories to share what they have learned about healing, self-empowerment, compassion, strength, grace, and the power of the human spirit. 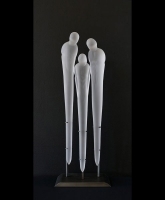 Their intent is to create sculptural forms and assemblages that embrace our common humanity. 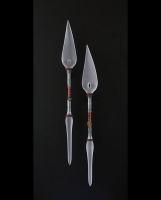 Their work is among museum, private and public collections; they are recipients of Pilchuck Glass School, Museum of Glass and Wheaton Arts residencies; and they are opening a 25-year survey exhibition with Bainbridge Island Museum of Art near Seattle on June 23nd, 2018.